This is the story of Tommi, a young Scottish woman living an ordinary life, who stumbles violently into her birthright as the world's most powerful werewolf. The sudden appearance of a dark, mysterious (and very attractive) guardian further confuses her as her powers begin to develop and she begins to understand that her life can never be the same again. The reader will be swept up in Tommi's journey as she's thrown into the middle of a centuries-old battle and a world peopled with expert warriors and vicious enemies - this is the start of a series - and a world - you will fall in love with. 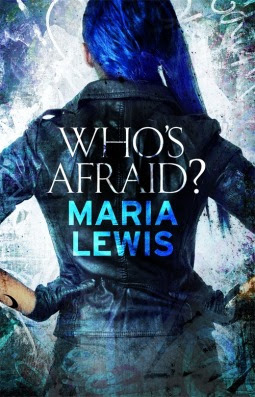 A new urban fantasy series begins with Who's Afraid, and it's not quite like any other urban fantasy I have read to date. Tommi is a smart, sassy young woman in her early twenties who is on her way to being a very powerful werewolf. Not that she knows that as she leaves her home of Scotland for a visit to New Zealand, where she hopes to meet the father she has never known. However once she arrives there and visits a small settlement outside Rotorua she finds far more than she bargains for. That's where she comes face to face with her heritage, and its tough. Returning to Scotland under the care of Lorcan, a somewhat mysterious carer and saviour, she returns to her apartment. It turns out Lorcan has been sent by the powers that be to counsel and guide her through the transition of becoming what might be a very powerful female werewolf. As she trains, an attraction builds between herself and Lorcan, but can it go anywhere and who is Lorcan? What else must Tommi face? The world building takes place gradually, the reader learns along with Tommi what it is all about. It is all nested in the ordinary every day life of Tommi and her friends. As Tommi narrates the story I not only came to invest in her but her friends as well. Will they ever know what she really is? Can she continue to exist in the world she has known up until this? There is definite danger, someone is out to attack Tommi if they can and you know for sure they will. Yet this book is more about Tommi finding herself, who she is, what she can do. How her life is changing. She often astounds Lorcan with her abilities, what might have been expected to take months, Tommi achieves quickly. As the story moves along I just can't help but really like Tommi with her blue hair and quick thinking tongue. There was just one part of the story I hated! It's dark! But then again I don't think Tommi liked it either. I really liked Lorcan too, he is an ex Praetorium Guard (a warrior) and now he is a custodian. He has been sent by the Treize - the rulers to be a guide to Tommi in her new life. He is so human but so other as well. And there is beautiful attraction between himself and Tommi. Enough let the author herself explain a little about this book. She's every bit as wonderful as her Tommi! Who's Afraid has been released in Australia and New Zealand and will be out worldwide in July. New Zealand born Maria Lewis got her start covering police rounds in a newsroom as a teenager and has been working as a professional journalist for the past 10 years. Her work has appeared in the New York Post, Empire Magazine, Huffington Post, The Sydney Mail, Junkee and Buzzfeed to name but a few. She lives in Sydney, Australia. I loved this interview with Maria Lewis. Even if you don't read the book listen to this articulate, vibrant young woman. Hiya Debbie, it's definitely printing in the US & internationally: release date is July, 2016. I don't read a huge amount but I have my favourites! Hmm, I'm just dipping my feet in the UF pool lately, but I'm intrigued. I definitely would buy the book if the author did a local signing- I can't say no to an author who I personally like! I am most likely a foot dipper too into UF, I don't like it all and werewolves are on the edge of my comfort zone, but this one was good. I know I just adore the cover. When I see these covers and read the reviews, like yours...I wish I enjoyed this kind of book! But I'm glad you did. Thanks for sharing. Laurel-Rain we have our points of loving the same and then our outer points of difference. I am not a huge fan of this genre but I read a little! I added this some time ago, probably b/c of you. It sounds so good. That song, "...Who's afraid of the big, bad wolf? The big, bad wolf? The big, bad wolf?" is running through my head. I'm intrigued! It's been a while since I've read UF. I'm glad you loved it! It was worth reading for sure. Nice to have you back around, I meant to call in, but kept slipping over the blog roll! I only read Patricia Briggs in this genre on a regular basis. However the NZ setting appeals to me. Keep the local authors and their books coming, Katryn! Good luck with this book, Ms. Lewis!